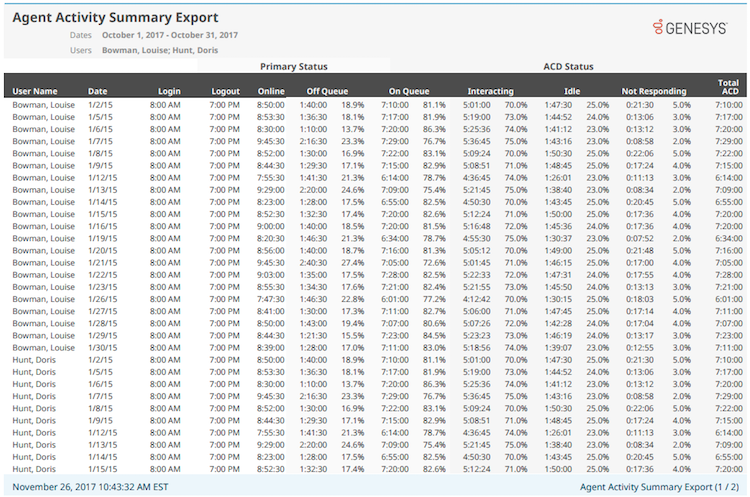 The Agent Activity Summary Export report displays a daily breakdown of the time that one or more agents spent in system and ACD statuses during a specific date range. The report sorts the information alphabetically by the last name of the agent and by date. Idle: The amount of time and the percentage of time that an agent spent in the Idle status. This routing status represents agents who are On Queue and available to take interactions but are not working with interactions. ユーザー名 The user that the row describes. 日付 The date that the row describes. 待機状態 The amount of time (hours, minutes, and seconds) and the percentage that an agent spent in the Idle status.